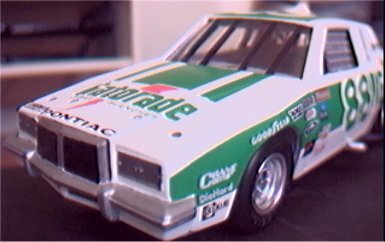 This is an original mpc pontiac model kit. 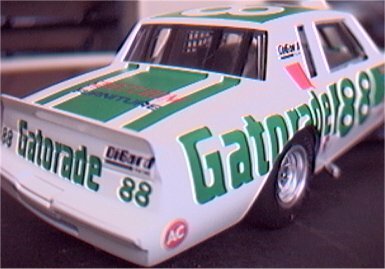 the best i can judge is early 80's, so with this i made a replica of Rusty Wallace's Gatorade Pontiac. The donor car was completely stripped of all paint and started up from scratch. I had to remove the windows and re compound them to get out all the years of bein exposed to the elements, results clear windows again.(-:. once the body was stripped and primed it was the usual stuff. The chassis & interior body have been sprayed ghost gray,as for the exterior body it carries gloss white. I did not clear this car because the when the white dried it looked as if it had already been cleared ,plu no chance of it yellowing in 4 years (-: the decals were from my personal stash and cant remeber who they are made by. The decals layed down so well you think they were painted on ,no kidding!!. as yoy know the original mpc kits were made curbside so no opening hood or engine. the bottom of the chassis has the exhaust pipes and rear axle molded in. the bumper & grille are painted metallic silver. head light doors & lower grille are decals. an original mpc pontiac model kit--RARE!! !